Here’s a shout-out to Katie for giving so much love to the blog! I’ve been a bit absent lately. And will be for the next few months. Remember when I applied for an MFA? Writing submissions, check. References, check. Acceptance, check! I was accepted into three of the four programs I applied for and am now happily enrolled in Lesley University in Boston. In fact, my first semester is almost half over. That’s like 1/8th done with the whole MFA! Okay. I’m counting pennies, but I’m so excited to be doing it. Critically reading young adult literature (and having to write essays about what I discover–still painful at this point). Ripping apart and rebuilding one of my manuscripts. Researching 17th century Holland for a different one. It’s all so interesting, stimulating. And how can my writing do anything but improve? One highlight so far has been working with my faculty advisor, Jackie Davies. She’s written a number of successful books for young people. My recent favorite is The Candy Smash, the fourth in a middle grade series about a brother and sister. I’ve learned so much from her guidance, and this kind of close mentorship was precisely what I was looking for in getting an MFA. It’s a great variety, and that helps keep me engaged, for sure. I’ve only just begun, but I am so excited for wherever I am going with this! From time to time, I’ll chime in to the blog, to share what I’m learning. And thanks again to Katie for keeping our blog’s momentum! Last fall, I took up running. I need to exercise regularly (and I hate the gym), and I was inspired by all of the amazing athletes at the Olympics. I was considering swimming or running, but running seemed like it would be easier to stick with, since I would just have to go out my front door instead of dragging myself across town to a pool. On my brother’s advice, I had my feet tested and purchased some specific sneakers to address some earlier problems with my knees and shins. And began running. A. It was too cold here in the Northeast where I live. B. I run early in the morning, and in the winter it is completely dark. C. The other neighborhood runners advised me to carry pepper spray, a stick, or a billy club in case I came across a coyote, who are out in my area early in the morning (seriously?). D. I would rather stay under my cozy duvet for an extra half hour (even with two kids and one husband sharing it) than brave all of the above. So instead, I exercised with our Wii Fit, which at least helped me burn some calories. But I wasn’t getting my heart rate up as high, and I missed the time to myself in the morning (my kids like to “exercise” with me when I use the Wii). I missed it so much, that this morning, with the winter waning, the sun rising earlier, and the temperature about 10 degrees warmer, I braved the elements. And it was wonderful. My mind easily focused on one element at a time. 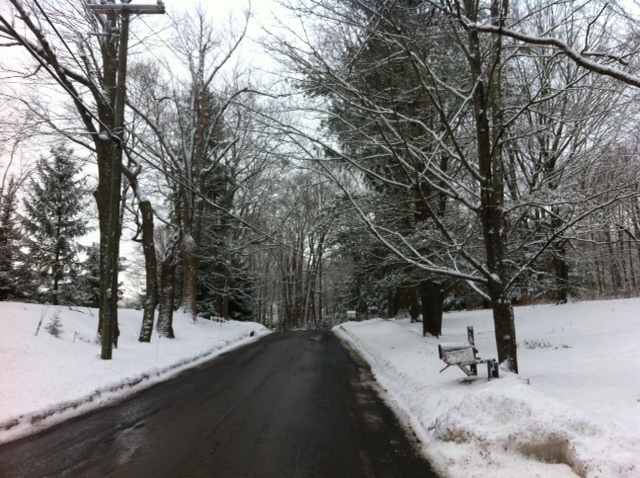 Fresh snow on the ground and clinging to the trees. The absence of cars or chainsaws or snowblowers. The crunch of my sneakers. The wind blowing past my ears. My heart beating. And my mind was completely, utterly, and amazingly clear. I took a deep breath and smiled. 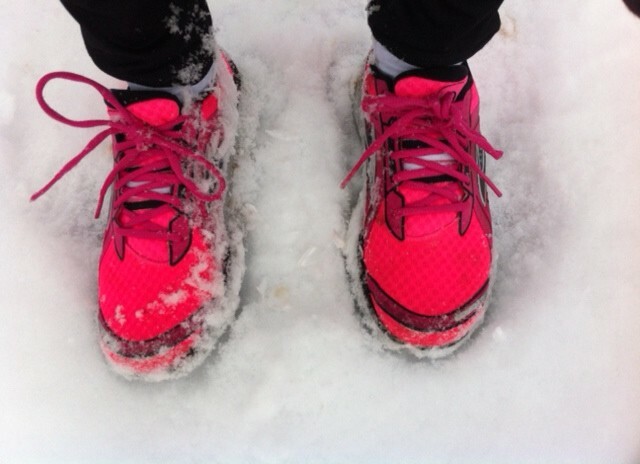 My husband didn’t even have to ask if it was a good run when I got home – he could see it on my face. Do you think they could see me coming? What do you do to step back and gain clarity in the craziness of daily life? Please share in the comments! I was fortunate to spend last Saturday and Sunday in New York at the SCBWI Winter Conference. I returned refreshed, re-energized, and ready to dive back into revision on my novels. I may even have a few new ideas for picture books! * Breakout Sessions: We each participated in two breakout sessions with editors and art directors on what “hooks” them. I chose sessions with editors Yolanda Scott of Charlesbridge, and Francoise Bui of Delacorte Press. Both were insightful, giving examples of books they loved that they had edited that demonstrated the different components that hooked them. I was thrilled to discover Jane Yolen sitting in the row in front of me in the first session. * Day 2 Keynote: Margaret Peterson Haddix gave a talk entitled “Tell Me a Story.” She wove together personal stories with tips on how to tell a good story. She told us that “books help kids understand and make sense of the world.” Our important role as children’s writers in the tender early development years of life was a common thread among many of the speakers. * Second Keynote: Julie Andrews and her daughter Emma Walton Hamilton shared their learnings from writing several series (the Dumpy series, the Little Bo series, and The Very Fairy Princess series) together. It was a multilayered talk, and Julie Andrews was everything you would expect: graceful, classy, beautiful, and talented. I was pleased to see what a wonderful relationship mother and daughter have, and how their many years of writing together transcends the typical “celebrity” children’s book writing one might expect. Joanna and I both love to “collect” rejection stories of successful writers… probably to inspire us to keep going. For Mo, he shared that over a 90 day period in his writing career, he got a rejection letter every day. Yes, 90 rejection letters. And look at him now! Overall, it was a good conference, full of learnings and ideas. At the end of the conference I participated in the autograph party. I had an amazing opportunity to have 2 books autographed for my children: We Are In a Book! signed by Mom Willems (with a little piggie adorably drawn above his name) and The Very Fairy Princess Follows Her Heart signed by Julie Andrews and Emma Walton Hamilton. Not only was I able to obtain two great keepsakes for years to come, I was able to talk briefly with each of them. I had the opportunity to thank Mo Willems for his Elephant and Piggie Books, since they are the reason my son (an initial reluctant reader) now loves to read. I told Julie Andrews and Emma Walton Hamilton that my daughter thinks she is a princess like their character Gerry. Truth be told, I could have talked to Julie Andrews about the weather, and I would have been perfectly happy. She and her daughter were just lovely. For more information on the conference, check out the SCBWI Blog. This past Monday, two of the premier awards for children’s books were announced: the Caldecott and Newbery Medals. The Caldecott is awarded annually for distinction in picture book illustration. The Newbery is awarded for distinction in children’s book writing. You can learn more on the American Library Association’s website. Congratulations to all of the winners! Looks like this is an extra good year for Jon Klassen. So my mission today was to venture into the smallish Barnes and Noble in my town with my daughter, and spend some time looking through the books listed above. The only two I have read previously are Extra Yarn, and One Cool Friend (which we own). Unfortunately, my bookstore had NONE of these award winners. Very disappointing. I could go on and on how our Barnes and Noble needs to move into the space vacated by Borders so that it can have a proper selection, cafe, and places to sit… but that could be a whole post in itself. So I will have to share my impressions on these books at a later time. I can tell you that both Extra Yarn (a tale about a girl who finds a magic box of yarn and proceeds to knit sweaters for everyone and everything) and One Cool Friend (about a boy who sneaks a penguin home from the aquarium in his backpack) are lovely, and are made even more charming by their illustrations. Tomorrow I’m off to the winter conference of the Society of Children’s Book Writers and Illustrators (SCBWI), and I should have much to tell when I get back. Have a great weekend!